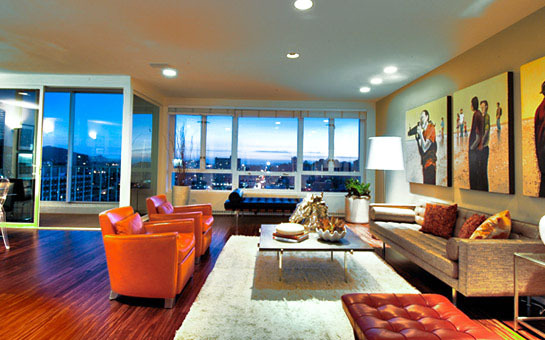 1200 California Street is one of the most luxurious contemporary stock cooperative buildings on Nob Hill. The glass enclosed vestibule is enhanced with a tranquil pool, striking contemporary steel sculpture and tall greenery to the spacious lobby appointed with fine furnishings, rich wood paneling and oriental carpets. Ascend the elevator to the tenth floor landing graced by wood paneling, antique mirror, side table and objects d’art. Prospective Buyers are advised to review, prior to any offer, the Property Disclosure Package available on request; the sale is subject to approval by the Board and HOA. The light-filled southwest corner apartment features expansive picture windows, tall doorways and recessed lighting throughout. Strikingly beautiful new hardwood floors are laid in the public spaces and carpeting in the bedroom wing. Enter the spacious FOYER to the invitingly open LIVING/DINING ROOM which enjoy expansive landmark views from the Bay, Golden Gate Bridge & Palace of Fine Arts to Lone Mountain College, the towers of St. Ignatius Church & Twin Peaks. The south/west facing SOLARIUM adjoins serving as a spectacular view yet intimate corner. A wet-bar is located in the corner of the living room. The service entrance is off the kitchen. The very private bedroom wing is carpeted and features ample storage closets. The spacious MASTER BEDROOM enjoys the west views and features a dressing room with custom storage. The adjoining MASTER BATH has marble surrounds and double shower with steam. The second BEDROOM or MEDIA ROOM, also with the spectacular Golden Gate Bridge & west outlooks, features built-in cabinets and bookcases. The second BATH has marble surrounds, pedestal sink and shower over tub. The apartment is ideally located for the City dweller or as a pied-a-terre. Grace Cathedral, Huntington Park and the world renowned Big-Four hotels and restaurants are all atop Nob Hill. Ride the convenient cable cars to the Financial District, Union Square and Fisherman’s Wharf. The best of San Francisco is virtually at your doorstep! The signature San Francisco views at their very most beautiful!